The pecan tree (Carya illinoensis) is a magnificent, shade-producing, specimen tree that yields a bounty of tasty nuts loaded with health-promoting goodness. The pecan tree is the only major nut-producing tree that occurs naturally in North America; it was first discovered growing in Iowa and throughout regions of the Ohio River valley. The known history of the pecan can be traced back into the 1500’s. Since the pecan trees grew extensively in the bottomlands along rivers, the nuts were easily accessible from the waterways, making the wild pecans a major food source readily available to the Native Americans. In addition to the great taste, their thin shells made the pecans a more desirable food than some of the other more hard-shelled wild nuts. These same Native Americans also indirectly helped give the tree its name. It is believed that they used pecans to produce a fermented drink called “powcohicora,” which is where the word “hickory” comes from. The pecan tree is in the same genus as all the other hickory trees (Carya). The pecan tree is adaptable to climates in almost all of the eastern, northern, and southern United States, and can be grown in the landscape as a magnificent stand-alone specimen tree reaching heights of 120 feet and more (making it the largest of all the hickories). The greatest achievement of the pecan tree, however, is not the grand height it attains but rather the great-tasting nuts it produces. And if the taste of those pecans is wonderful, the health benefits derived from them is even more of a wonder. Pecans contain a significant amount of Vitamin E, which is a natural antioxidant. Research shows that adding a handful of pecans to your diet on a daily basis can help inhibit unwanted oxidation of blood lipids and, as a result, help prevent coronary heart disease. Amazingly, pecans rank highest among all nuts and are among the top category of foods containing the highest antioxidant capacity. This means that pecans may decrease the risk of cancer, coronary heart disease (as mentioned), and neurological diseases such as Alzheimers. A pecan-enriched diet has been shown to help lower total cholesterol and particularly the LDL or “bad” cholesterol. Pecans contain plant sterols, which are known for their cholesterol lowering ability. In addition, pecans contain more than 15 vitamins and minerals, including Vitamins A and E and several of the B vitamins, as well as calcium, zinc, magnesium, potassium, and others. Although nuts are generally high in fats, the unsaturated fat in pecans is heart-healthy fat (as found in sources like fish, nuts, and vegetable oils), and pecans contain no trans fat. 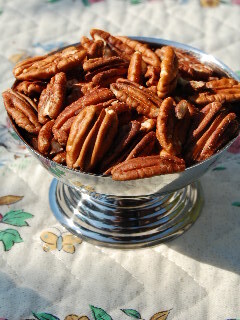 NOTE: Much of this information about pecans comes from the website of the National Pecan Shellers Association (ilovepecans.org). I urge you to visit their site for more fascinating facts about the wonders of pecans. Now, on to the dessert. While pecans are a great addition to a healthy diet, either consumed raw by the handful or added to salads and other dishes, I am including a recipe for one of the all-time classic uses for these delicious nuts—pecan pie! Not really health food, you understand, but truly tasty. After a healthy meal of wholesome vegetables served along with either grilled fish or maybe baked chicken, why not treat yourself to a slice of old-fashioned decadence—Mama’s Pecan Pie! Mix sugar and flour together. Add beaten eggs, melted margarine, syrup, and vanilla; then the chopped pecans. Mix well and pour into an unbaked pie shell. Bake at 450 degrees for ten minutes, then at 300 degrees for about 35 minutes. 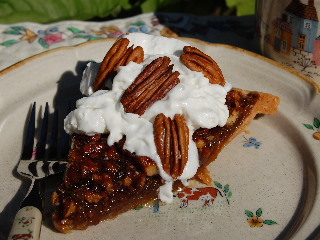 Before serving, top with whipped cream and a few more chopped or whole pecans. Enjoy with a cup of steaming hot coffee!